Filecamp is a cloud-based digital asset management (DAM) software that allows users to upload, control, share and collaborate on files. However, what makes this program stand out is its easy-to-use platform and how it does so much at just a fraction of the cost of other similar services. Boasting of a multi-functional Software as a Service (SaaS) model, Filecamp helps businesses manage their files in a secure cloud environment without requiring them to shell out too much money for it. Its straightforward format also does not compromise on important functions, which include optimized file sharing, lightweight digital asset management and online proofing and collaboration. Filecamp’s primary file sharing function allows users to build up their brand. The software is reliable enough to handle transfer requirements of small startups to large corporations. The file portal that contains client assets can also be customized in order to integrate brand elements, giving it a unified look and feel. With this feature, business owners can collaborate with partners in an online environment that effectively represents their brand. Companies who use Filecamp can also see to it that their assets are efficiently used. The software’s HTTPS-based platform makes different types of files easily accessible anywhere and anytime there is an internet connection. There is no need to install programs in order to make Filecamp run. While it is easy to get started on it, log-ins and usage are still very much controlled. All of Filecamp’s affordable plans also permit unlimited number of users and unlimited bandwidth. The software’s online proofing and approval functions streamline a company’s creative work processes. Revisions, comments, and approvals are properly documented on cloud-based files in order to avoid miscommunications. Coordination time needed to complete projects is significantly reduced. Team members also do not need to worry about chasing after their bosses for approvals whenever they need to leave for a long period of time. 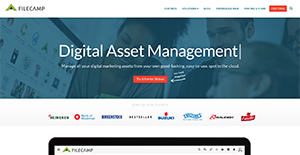 If you are considering Filecamp it might also be beneficial to examine other subcategories of Best Digital Asset Management Software collected in our database of B2B software reviews. Every enterprise is different, and might need a specific Digital Asset Management Software solution that will be designed for their business size, type of customers and employees and even individual niche they cater to. It's not wise to count on getting a perfect solution that is going to be suitable for each company no matter what their history is. It may be a good idea to read a few Filecamp reviews first and even then you should keep in mind what the service is intended to do for your company and your staff. Do you require a simple and straightforward app with just elementary features? Will you really use the advanced functionalities needed by experts and big enterprises? Are there any specific tools that are especially practical for the industry you operate in? If you ask yourself these questions it will be much easier to locate a solid app that will fit your budget. How Much Does Filecamp Cost? We realize that when you make a decision to buy Digital Asset Management Software it’s important not only to see how experts evaluate it in their reviews, but also to find out if the real people and companies that buy it are actually satisfied with the product. That’s why we’ve created our behavior-based Customer Satisfaction Algorithm™ that gathers customer reviews, comments and Filecamp reviews across a wide range of social media sites. The data is then presented in an easy to digest form showing how many people had positive and negative experience with Filecamp. With that information at hand you should be equipped to make an informed buying decision that you won’t regret. What are Filecamp pricing details? What integrations are available for Filecamp? If you need more information about Filecamp or you simply have a question let us know what you need and we’ll forward your request directly to the vendor.